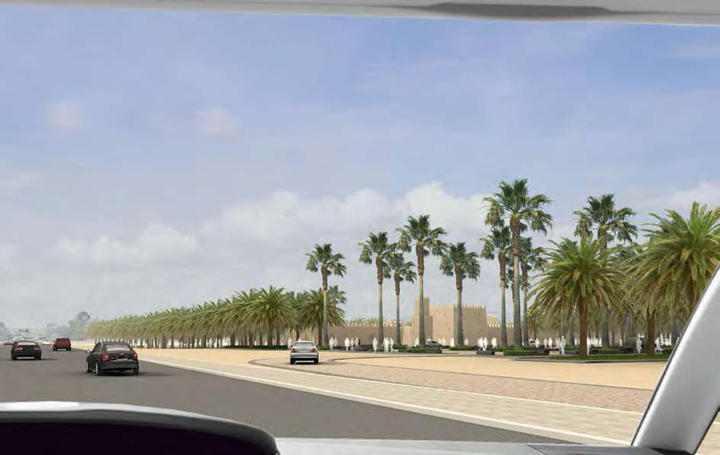 JB: What were your first thoughts about the Qasr Al Muwaiji project and how did these translate into the design of the project? JS: The main idea is the fort itself. And I always tell the same story, which is absolutely true. This is actually a very modest building. Its construction hardly amounts to a building. And in its original context it was practically by itself on the outskirts of the big oasis—defending the oasis. What really impressed me was seeing this Fort as an almost perfect square of four walls. For practical purposes, I’m sure what they had that in mind was to make a perfect square. And so it is the basic definition of an interior space carved out of an exterior space—to make a difference by just doing this simple cut-out of the desert – and of the sky. And this is just totally transformative. Same floor, sand, outside. There are no actual buildings with the exception of the corner bastions which are defensive structures. And one of those, which they call “the palace”, is an extremely modest two-story residence. They basically had tents inside this square precinct. They were nomads so they lived in their tents. But they put the tents inside the precinct so they could be defended. 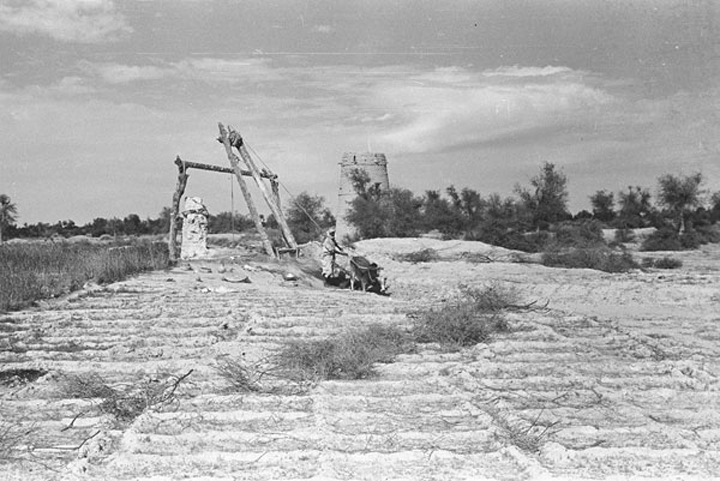 There is a well inside, which explains why the Fort is there, in the desert, because that’s where water was available. And they had livestock...goats and camels inside together with people with rifles to defend all of it. And that was basically it. What impressed me, seeing it after it had been cleared of its function, is that it had almost nothing, to paraphrase George Costanza in his best Seinfeld episode. But since we are architects, you never say no to a job. But really, nothing should have been put there. ...So the idea was that whatever we put there should interfere in the least possible way with this emptiness even as we knew we had to locate a building in some of this open space. A lot of things lined up well because then we decided to lean the building against the south wall so it would be mostly in shade during the day, getting a bit of direct sunlight in the morning. And then more importantly are the materials. Immediately after acknowledging that this square emptiness was what we needed to preserve, I began thinking that the new building had to be glass. But then I denied it immediately.“You can’t make a glass building in the desert!!! It is just like the worst idea ever!” And then we went through all the possible materials that would have to go along with mud walls and concluded...well... that it had to be glass—it cannot be brick, it cannot be masonry of any sort, it cannot be mud again, it cannot be metal. JB: What was the original scope of the job? JS: The original purpose of the project was to preserve the fort because the current President of the Emirates was born there. And that is initially all we had. But we also had Barker Langham, the cultural planners (that’s a new profession) who came up with an idea. 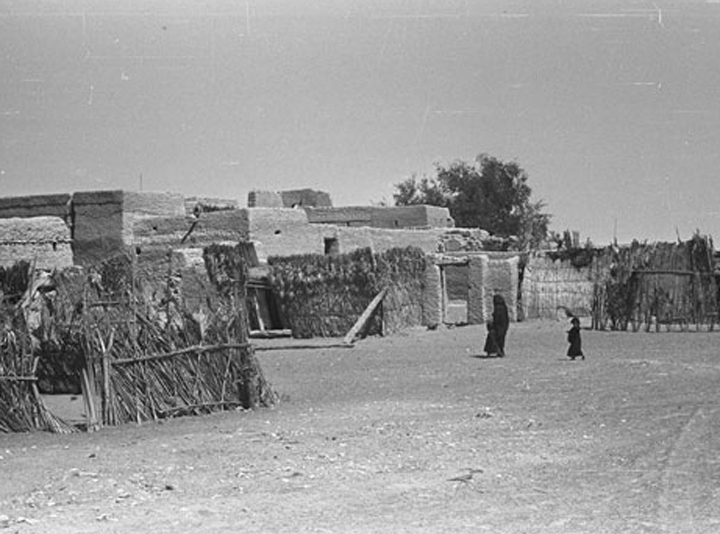 They did a lot of good research and they found, for instance, archives of photographs, mostly by English photographers of the 1940’s and 50’s that had crossed this part of the desert, which is the harshest part of the whole Arabian peninsula. So there are all these photographic records—plus letters, some documents... They found those things in England, not in Abu Dhabi. And then they actually said we can re-construct and present the history of this region as it was at that time with some written and visual documents. And it emerged that it was going to be something about the history of the entire Emirates. 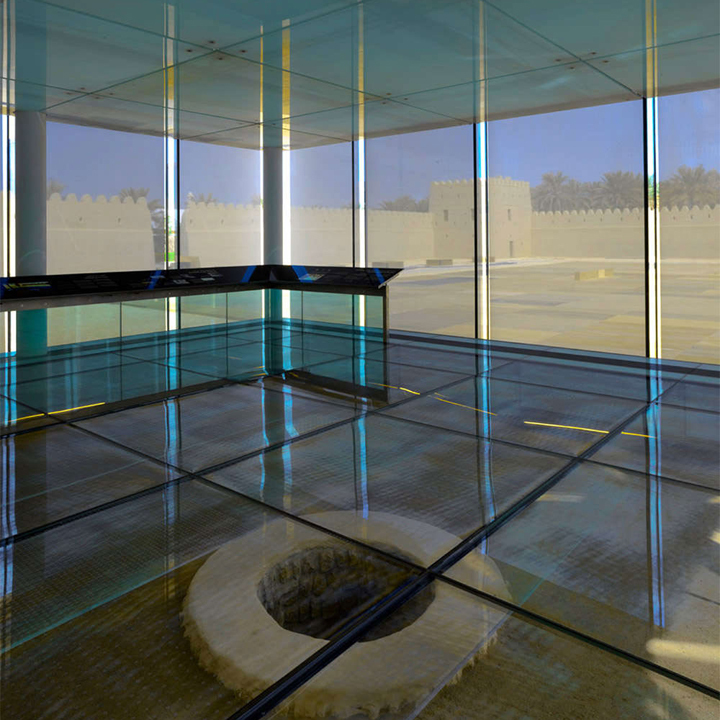 JB: The use of the glass and the corresponding details seem to be very sympathetic to your understanding of this site as distinguishing between something that is semi-permanent, like the mud walls and square geometry, from and something that is temporary, like the nomadic tents. And the new construction actually reads somewhat like a temporary structure in the middle of the fort. It is clear that the use of glass is a way to see the entire physical evidence of the fort but there is something about the object itself, and again in the detailing of the railing and ramp... it seems that it could have been carried in and maybe some-day it could be carried out. JS: It’s not done that way and it probably won’t be carried out. But on the other hand it has that nature. It has that kind of character. The architecture’s rhetoric makes a point of saying “this is a building that truly floats”. And it floats because it doesn’t want to touch anything and indeed, it doesn’t touch any of the original structure. 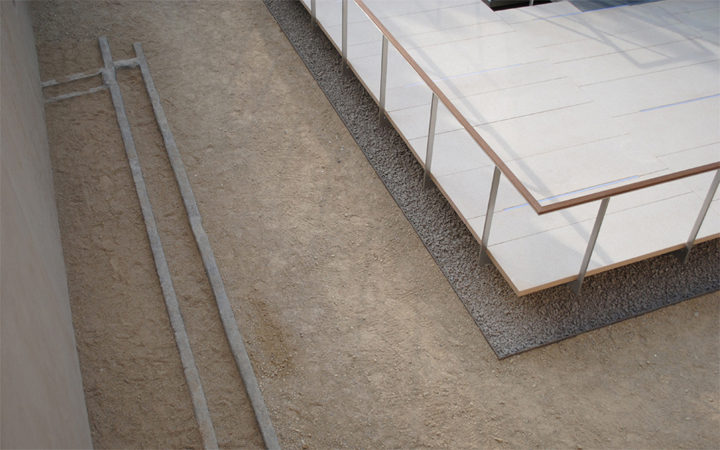 This was partly because of a requirement for protecting the archeology of the site and the ground. And this represents a portion of our technical novelty in the building because we could not use conventional foundations. We could not dig beyond about twenty centimeters into the earth, so really, there are almost no foundations! The building, from a structural point of view, is really resting on the ground. It has been detailed with a lot of expressive determination and with numerous fights with the engineers, in order to produce a building that looks like it is levitating over the sand. JB: Thinking back now across this project, Bowdoin, Getty, Menokin... There seems to be an interest in an idea of contrast. That the efforts of cultural heritage work suggest that there is going to be a thing that is the center of attention—and then another thing—the new construction that is supposed to support it. JS: Well this is one of our principles—although not necessarily giving more importance to one or the other. It actually coincides with the recommendations of UNESCO and other similar institutions. But I think what we do goes well beyond it for other reasons too. Because we think that whatever is new in a project of cultural heritage should be very different, so there is no mistake in confusing what is new with what is old. So that is a kind of policy that is recommended. What is also recommended is to try to alter the existing as little as possible. JB: How do you achieve a glass building in the middle of the desert? JS: Let’s talk about things that are architectural. Glass gave us an opportunity. And this is related to the issue of contrast. In the case of Al Muwaiji in particular, we can talk about contrast as a strategy. But it is not that we want to contrast in general and always. What we do want is to create a very clear difference. A difference that is visual, but also, let's say, historical and experiential. 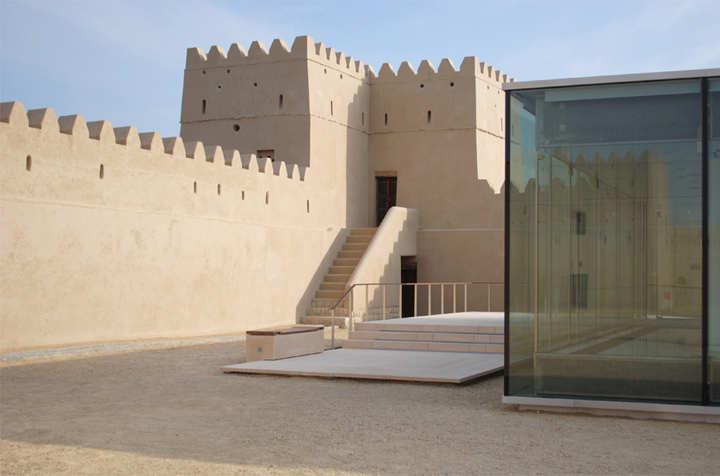 At Al Muwaiji we had to accept the kind of crazy architectural idea of our proposal that was to design a glass building, however contradictory it might seem with today’s idea about what a building should be in the desert. But we thought that given the cultural importance of the fort and its identity, we needed to put something there that had nothing to do with the fort. The fort is so minimal, its one material and its one wall, and there is not a lot to work with other than with contrast. 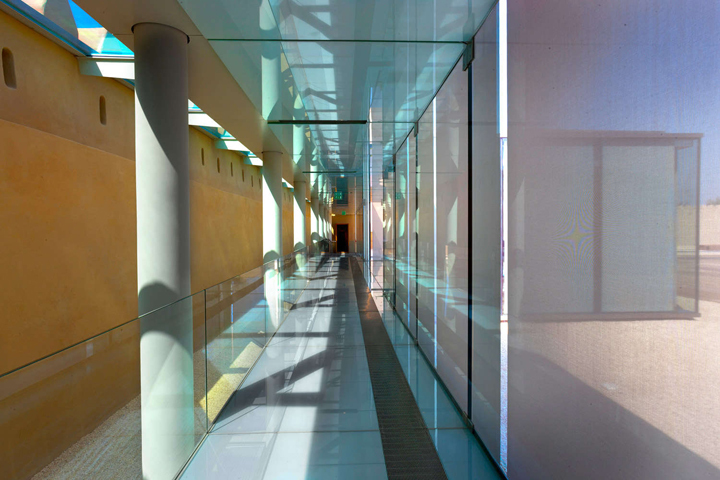 And we thought that transparency was something to work with and its accompanying attribute of lightness was also something important to utilize. And in many ways this is the total opposite of a thick mud wall. Because it is transparent but also it is thin and it is clear. And then following this logic of material and in a true architectural process of obsessive thinking I said, “...you know what, this is going to be glass but it is going to be all glass all around and all over!” The ceiling was going to be glass and the floor was going to be glass too. Moreover, even if it's not physically true, glass gives you the feeling of coolness, of cold; glass is a cold material. It is the opposite of a warm material... the opposite of wood, certainly the opposite of mud. And for once, the coldness of a space was something that could be understood as good—psychologically. I mean, you enter a glass box and you walk on glass and the ceiling is glass. Of course then we minimized that because we put “a carpet” of stone over the glass so you really walk on stone and the glass is only on the borders. But there is also the moment when you walk on only the glass and you see the well below and realize that you are in the air. The whole architectural resolution is pretty tight and very consistent—I believe it has tremendous architectural integrity. JB: What is outside the Fort in the landscape? JS: There is a tiny building at the entrance with a tiny courtyard. It is a typical mosque and it has all the requisite elements. And outside there was the house of the imam who runs the mosque. 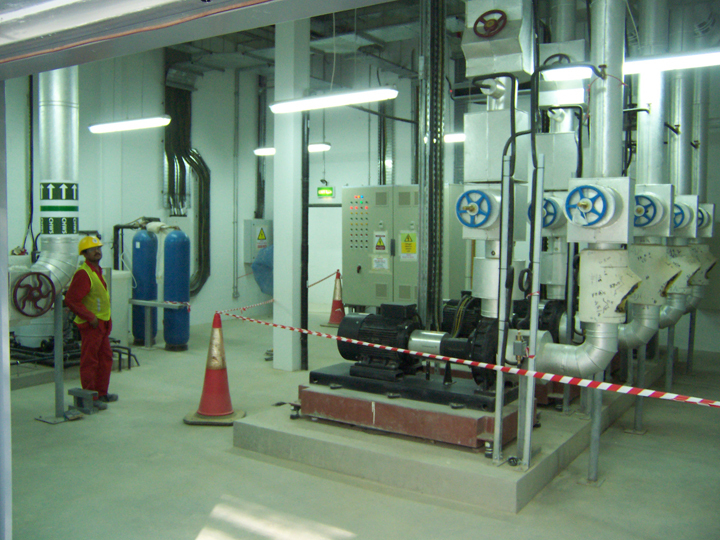 That small house is now occupied by the air conditioning equipment...full of these amazing systems. JB: Would you talk a bit about the grove of trees? JS: Well, when we went there, the grove was already in existence. Native date palms were planted on a perfect square grid. And this is preserved. However, all the trees were replanted after construction. The original gardens were sited in the sand, so the garden is totally new, irrigated and it is beautiful. And it was done by our friend Imad Gemayel, a very talented landscape architect from Beirut. We all worked together on the garden and the grove but he is the one that came up with the planting and irrigation ideas. One thing that you and everybody knows is that the desert is “a desert.” I mean, there is no question that the desert is what we think—it’s all sand. But there is, here and there, some vegetation in the desert. And this vegetation is usually grasses. 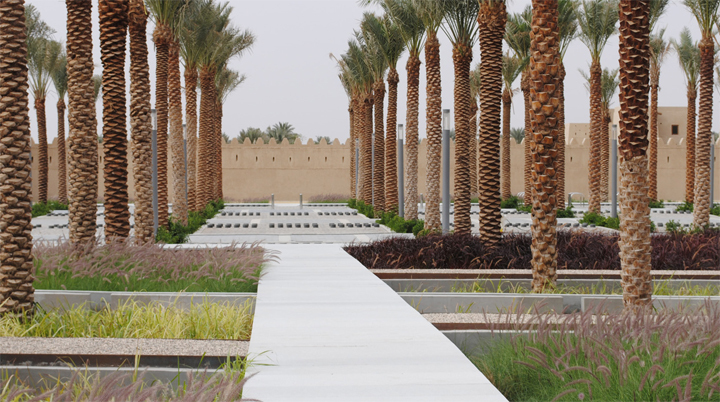 Our garden at Al Muwaiji is a garden of grasses, basically, of different colors. 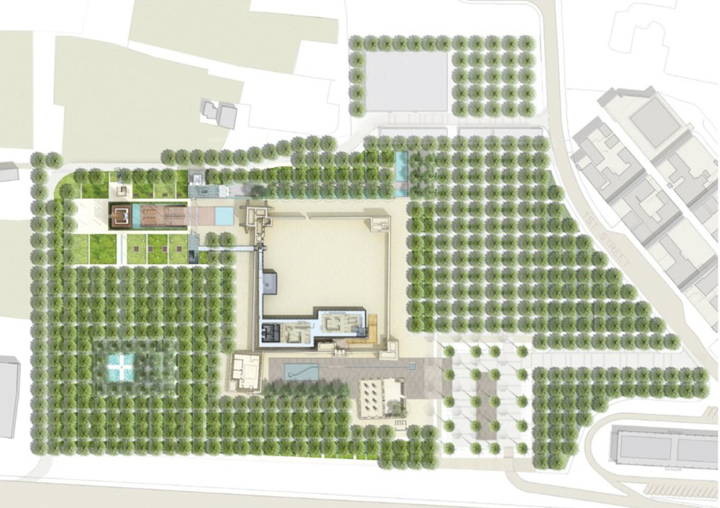 Then there is the idea that originates with the water canals in the Abu Dhabi oases that they used since the beginnings of their society. 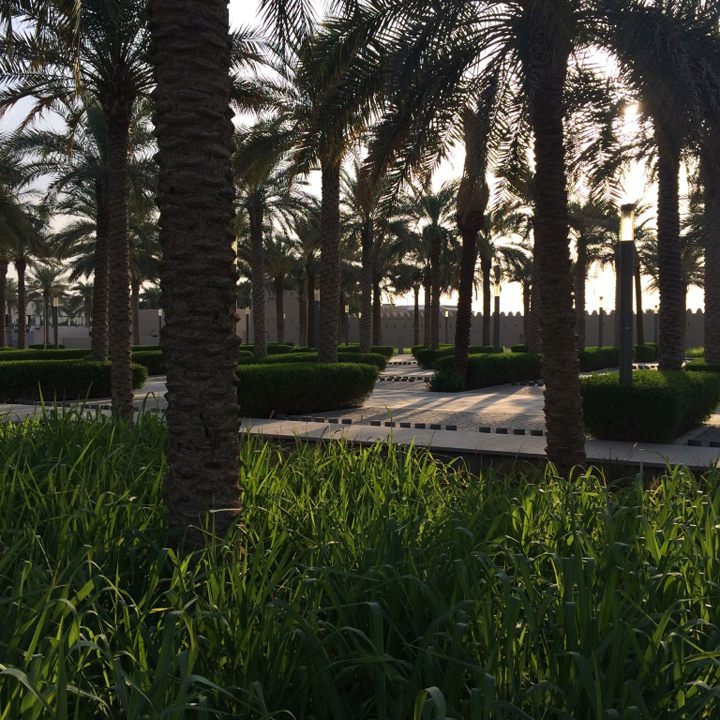 They are called “falaj.” The palm trees and all the grasses are watered regularly and there are walks throughout. The trees, the canals and the grasses organize the parking area too. The palm trees create a continuous canopy of shade all around. The fort, because of this dense vegetation, was not really visible from the street, which is the main highway that joins Abu Dhabi with Al Ain. In the new garden and grove the building is now visible because we recommended very tall palm species for one specific visual corridor from the highway—so you could see through the grove and into the fort when you drive by. There were doubts, because we had to bring a of palms that are not native to the place. We just wanted to show the building!